Fit can mean two things in cycling. After a winter of too much time spent on the trainer in the basement working on the obvious one I plunked down the cash for the second — a bike fitting. This was my first fitting, ever. No new bike involved and no injury problems, just thought it was time to see if a proper assessment of my set up would produce benefits. Over the years, I had heard a range of views on bike fittings from "you're nuts not to have one" through "can be useful" to "waste of money" and I was interested to see where I would end up on that spectrum. 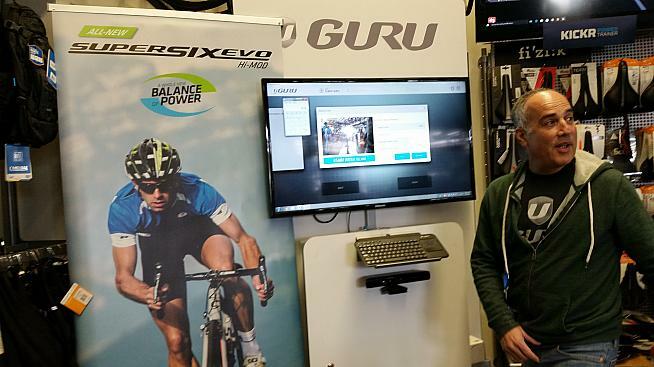 The author being assessed on the GURU Dynamic Fit Unit at Greenwich Bicycles. My traditional spring-just-around-the-corner service of the Lynskey seemed to be the logical time to get it done. I had read up on what to expect, but it was still a fascinating process. 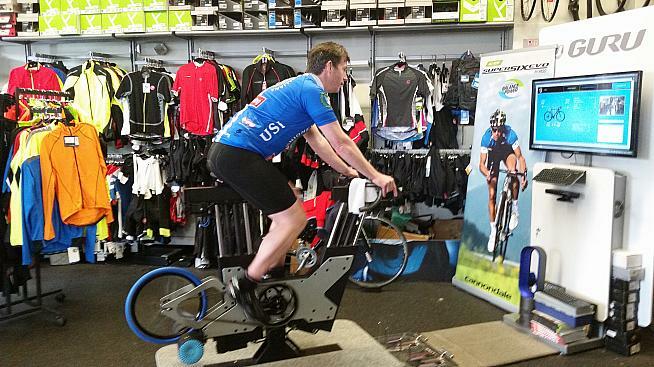 The fitting was at Greenwich Bicycles in Connecticut and owner Rob Koshar ran the show. The roughly two hours was broken into three sections. Preliminary measurements were followed by pedaling on the GURU Dynamic Fit Unit, an adjustable proxy for a bike, before the agreed new position was translated into reality on my bike. Backing up, since late 2014 I have been riding a Lynskey R255 and had accumulated close to 4,000 miles on it by the end of 2015. Apart from having to break in the saddle over the first few months, I have not had any significant issues and, as mentioned, have stayed injury free. The Lynskey has been extremely comfortable even on long days like the Maratona dles Dolomites and Gran Fondo New York, which are the kind of riding it was designed for with its relatively high head tube and geometry modeled on the Bianchi Infinito. I have raised the saddle by small increments a couple of times and going into the fitting my saddle height was considerably higher than three years ago when I got back into road cycling with the purchase of a Specialized Secteur Sport, now locked into the turbo trainer in the basement. The Secteur was, I think, the right bike for me at the time, but I cringe at how low I had the saddle. 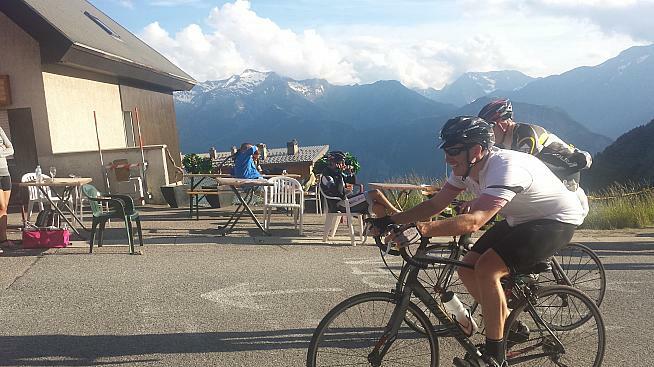 Approaching the finish line of the Marmotte in 2014 in need of a bike fit. On one of my first Gimbels rides the ever-friendly Peter suggested I might want to raise it quite a bit. Good advice. Despite the gradual increase in my saddle height I still felt like I was sticking up above others in the paceline with their slammed stems and it seemed sensible to get professional advice. 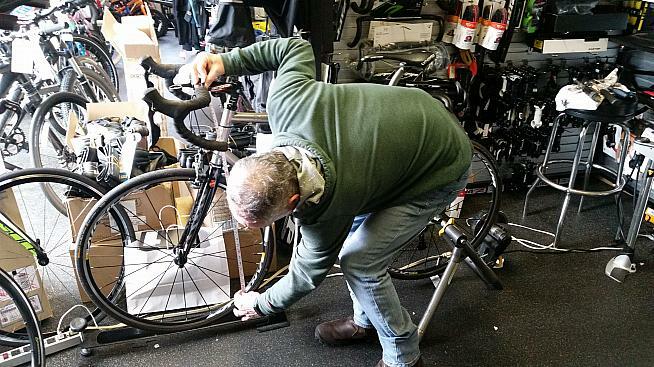 At Greenwich Bicycle, amid the floor to ceiling racks of carbon fiber goodness (as well as a few Cannondale Slates) a sizable proportion of the shop's 1,900 square feet of floor space is given over to the GURU fitting system. As well as square footage, the machinery is clearly a significant capital expense and Koshar explained there is a monthly cost to have access to the database behind the system. The GURU Dynamic Fit Unit. 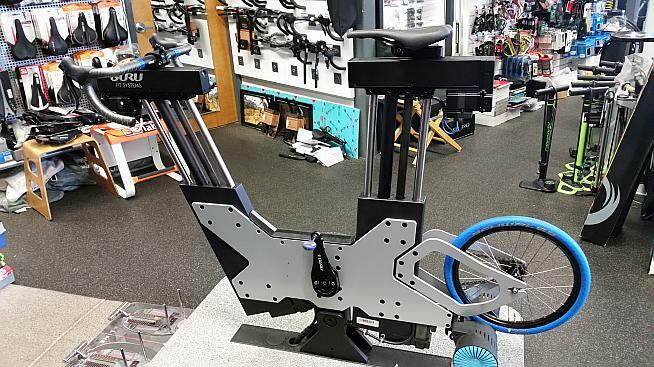 "The shop revolves around it," said Rob, who believes that having a premium fitting set up sends a message as to the level of expertise and service on offer when people walk in and see it. For many customers it is a key part of buying a new bike and the appointment after mine was for a rider trying to decide on which high-end beauty to purchase. "Ideally we do the fit first," said Rob, who has decades of experience with various systems. The four trained fitters at the shop — one of whom is a mechanic who usually then makes the required changes — do around 150 fits a year. Speedplay pedals were already attached, but before I climbed aboard the adjustable jig I was scanned by a camera beneath the screen. It projected a stick person of blue lines over my image capturing the lengths of my bones. It took a couple of attempts for my collar bones to sort themselves out. 44cm bars, 2cm wider than mine, and a suitable saddle were selected and then it was onto the machine and start pedaling. Rob adjusted the suggested starting point having measured my Lynskey by tapping on the screen in front of me and let me spin for few moments to settle in. Rob Koshar of Greenwich Bicycles at the control screen. The GURU unit allows both saddle and bars to move up and down and fore-aft so that eveything can be adjusted with a tap of the finger without the rider dismounting. Initially, it was a weird sensation as things moved under me as I span away. 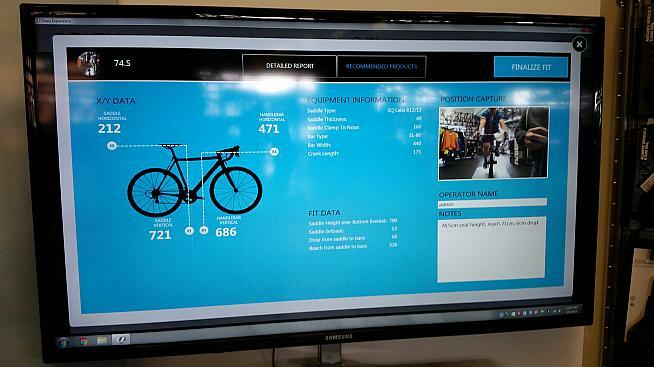 "You know, this is a far superior system because you never have to stop pedaling or get off the bike" said Rob. "It really captures customer feedback more effectively." Rather than a static event based on set ratios, Rob used the GURU machine to flex my position, explaining the interlinked effects of each change as we went along. Having set a default position and agreed on what seemed like a good saddle height, he tinkered with the various parameters to give different options from the more conservative to the aggressive. With every move I was asked how it felt and where I was feeling the difference. He noted that I pedaled toe down and tended to lock out my left elbow. Changes were usually in increments of 1cm or even 5mm. Some I hardly registered, others seemed like huge alterations. The most exciting moment came when Rob mistakenly instructed a rise in saddle height of 6cm that got the alarm bells ringing and almost resulted in an emergency unclip to prevent rather painful damage. He is not a believer in the importance of cleat position and also is not fixated on getting the knee exactly over the pedal spindle, describing it as a "pseudo science" with no proof that it was ideal. He said that in his experience nine out of 10 people opt for a more forward position. I was one of the nine and selected Position Four saved in the system after comparing all four against each other. The summary: Seat up and slightly back, bars down (spacers out) and shorter stem. The data are captured in the GURU system. Once settled on Position Four, Rob confirmed the dimensions captured by the system using a tape measure and plumb line and then found my bike in the GURU database. From the manufacturer's data he worked out that I needed a shorter stem to prevent too long a reach given the desired changes. A laser level was then wheeled out and centered on the Lynskey's bottom bracket to allow perfect measurements. A 10cm stem was swapped in for the 11cm one that came with the bike and in the process two 10mm spacers moved from beneath to above. The saddle went up 2cm for a new saddle-to-bar drop of 6cm and after adjusting the fore-aft saddle position (complicated by sticky bolts, unlike me use grease!) and a minor tilt to the bars reach was right — bingo! — and Position Four had been mapped into physical form. I chose to stay with the 42cm bars. Rob measuring the Lynskey to confirm the adjustments. "I think you are going to have a little bit more power, be a bit more aero and the reach has stayed the same," said Rob. "Hopefully, you come back and say 'it made a big difference'." The 36 hour wait until heading out on the Gimbels was filled with questions — would there be a big difference, would the handling be affected, had I conned myself into too high a saddle and bars too low, would my back seize up, would I feel any difference at all? One ride is not enough to make a final judgement, but none of my fears were realized. It was a great thrash around Westchester County and having done more than my fair share of work bringing the pack back together a couple of times I finished up near the front, which is good as I ever do. It did feel different, however. Having never thought about it, I was now conscious that the bars were slightly narrower than my shoulders and that I tended to lock out my left elbow. Also, although I have no irrefutable evidence, I am pretty sure I defaulted to pushing a bigger gear at a slightly slower cadence than previously. Certainly, afterwards I felt it more in the glutes and hamstrings and less in the quads than usual. Conclusion: It certainly seems like $250 well spent (plus $50 for the stem). In retrospect, I wish I had invested in a fitting three years ago. Greenwich Bicycles: 35 Amogerone Crossway, Greenwich, CT 06830 - (203) 869-4141.